Redditor [mulishadan] — a fan of the movie WarGames — has created a singular thermostat in the form of a Defcon alert meter. Looking to learn some new skills while building, [mulishadan] tried their hand at MIG welding the 16g cold-rolled plate steel into the distinctive shape. A second attempt produced the desired result, adding a 1/4-inch foam core and painting the exterior. Individual LEDs were used at first for lighting, but were replaced with flexible LED strips which provided a more even glow behind the coloured acrylic. 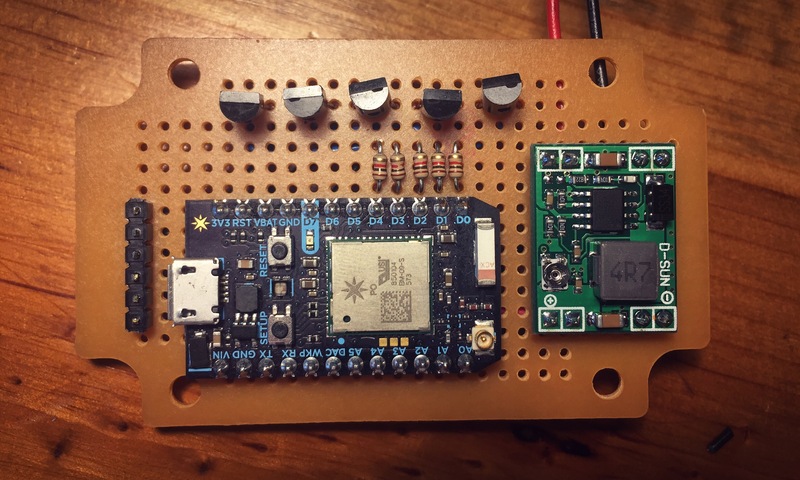 A Particle Photon board queries the Weather Underground API via Wi-Fi in five-minute intervals. Each escalation in the Defcon alert signals an increase of 10 F, starting at Defcon 5 for 69 F and below, up to Defcon 1 for 100+ F. The final build looks like a true-to-life prop with some useful functionality that can be adapted to many different purposes — proof that a relatively simple project can still produce fantastic results for entry-level makers. So why not try making this thermostat scarf as well?